For those who have been watching the “Vikings” television series, Season 3 has been dominated by the Siege of Paris. But what really happened at the siege? Fortunately, we have the poems of the monk Abbo of Saint-Germain-des Prés to give us a record of the events. But it must be kept in mind the monk was writing to glorify the French. We also don’t know if the combatants really used mangonels and trebuchets this early in the Middle Ages. But it makes for a good story! During the ninth century, while Charlemagne was in control of Western Europe, the Norse or Vikings as they came to be called, made little headway. They attacked and plundered the British Isles and settled in Iceland and even Greenland. But when Charlemagne died, local custom dictated that his three grandsons divide his kingdom into three separate entities. This created internal civil strife, leaving the area vulnerable to Viking assault with no united front to fight them off. In 845, the Norse sailed up the Seine and menaced Paris. During the 860’s there were many attacks and Paris was burned. Because of unstable government there was no organized armed resistance and pillaging and looting on a grand scale resulted, along with bribes to get the Norse to leave. Charles the Bald died in 877 and there was a succession of short term kings until Charlemagne’s three divided kingdoms became one under a single king again in Charles the Fat. Charles was not an accomplished military man and he appointed subordinates to oversee his distant provinces. The Duchy of France, the area between the Seine and Loire Rivers, was governed by Count Odo assisted by Joselin, the abbot of St. Germain. Odo’s father, Robert the Strong, in earlier times had been successful in driving back the Vikings and began the task of fortifying Paris. By the time Odo was in charge, Paris was in a relatively strong position with a tower, the Grand Châtelet and two bridges, one of stone, the Grand Pont, and one of wood, the Petit Pont. These allowed for foot traffic into the city but were too low to pass under, blocking passage by river beyond the city. Both bridges had defensive towers on each end. In 885, the Norse decided to mount a great expedition against Western Francia, also known as Neustria. A grand army assembled in Rouen in July under the command of Siegfried. The poem says there were thirty thousand men and seven hundred ships but this is entirely an exaggeration. Nevertheless, they probably numbered in the thousands. The Vikings intentions were not to seize the capital but to loot its riches. The Vikings sailed up the Seine River to the Pont-de-l’Arche where the fleet was halted by the fortified bridge. The Norse set up a camp where they were attacked by the Frank forces of the Duke of Maine, Ragenold of Neustria and Burgundian soldiers. Ragenold was killed in the battle. They pushed further up the river and appeared before Paris on November 24. The following day, the Viking leader Siegfried asked to speak to the highest authority. Abbot Joselin received him. Siegfried asked for passage beyond Paris and for tribute and in return promised not to attack. Joselin refused. The following day, Siegfried and his men attack the Grand Châtelet, the unfinished northern stone tower which was guarding the Grand Pont on the right bank. Odo, Count of Paris and even Abbot Joselin in the thick of the fight, defended the city with two hundred noblemen and a few soldiers according to the monk Abbo. The Vikings used mangonels to hurl javelins, large stones and other combustible materials into the city. They erected covered walkways to protect them from being pelted by the besieged allowing them to get near the walls and towers. The defenses of Paris, including the two bridges fitted with turrets, made it impossible for arrows and projectiles to penetrate. The Vikings loaded up their ships with men armed with bows, javelins and slings which they used to shoot at the townspeople to keep them from coming to the defense of the threatened walls. The next day the Vikings found the Franks had reinforced the tower overnight. Once again they attacked the tower with catapults, rams, fire and mining but to no avail. The fighting was terrible and cruel for the next two days. The Grand Châtelet suffered assault after assault with no success. The Norse then tried to scale the walls but the Franks poured boiling oil, wax and pitch on them. Many of them are killed and they were forced to change their tactics. They begin the siege of the city. For the next two months, the Vikings mined the city and scoured the countryside for provisions. On January 31, 886, the Vikings divided into three groups and launched a general assault in three areas: the tower, the Grand Pont and the right bank both on land and on the river. The Franks maintained their position. The next day, the Norse attacked the tower again. The following day they moved forward with three rams but the heavy fire of the mangonels and trebuchets by the Franks bar the rams from being effective. They threw fireballs at the Petit Pont but they mostly hit the stone piles with no damage. The Vikings set fire to a few ships, floating them toward the bridge but unfortunately, the ships burned up before they could light the bridge. They tried to choke the river at the bridge with earth, tree branches, carcasses of oxen, horses and executed prisoners. On February 3, the Vikings retreated to their fortified camp with their siege engines, leaving the rams to the Franks. Siegfried took his troops to pillage the eastern Franks near Reims. On February 6, the Petit Pont finally gave way due to heavy rains and floods. The Norse take the small gatehouse which was defending the bridge on the left bank of the Seine, isolating it from the city. The dozen men who had been defending the gate house were killed. The Vikings could now bypass the bridge and sail down the river to pillage Chartres and Le Mans and plunder Evreux. The siege drags on. In March, calls by Joselin to the Count of Boulogne and Count Henry of Franconia bring in reinforcements but they are unsuccessful. The Vikings settle on the left bank of the Seine around Saint-Germain-des-Prés. Odo and Joselin began negotiations with Siegfried. They offered him sixty pounds of silver to end the siege. Siegfried takes the money and then heads for Bayeux to attack and loot. Some of his men, including Rollo, are dissatisfied they received none of the tribute and refused to go with him. This disgruntled group continued to unsuccessfully attack Paris. Abbot Joselin died on April 16, falling victim to an epidemic in the city. The besieged are beginning to lose hope of reinforcements. Sometime after May 28, Count Odo secretly leaves the city to seek help from the emperor Henry of Saxony and from Charles the Fat. The Abbot of Saint-Denis effectively defends and holds Paris in his absence and ensures a steady supply of provisions reaches the city. Odo’s news that Henry was coming with troops and a fresh shipment of supplies raised the spirits of the Parisians as well as dampened those of the Vikings. In July the emperor is at Metz and decides to march to Paris in relief but is hampered by rains and floods. Henry died on the way to Paris. Charles the Fat takes his time getting to Paris. Before the arrival of the reinforcements, the Vikings tried a new tactic and the walls no longer held. They enter the city and loot the monasteries and kill whoever stands in their way. Knowing the troops are arriving soon, they leave the city. By October, King Charles and his soldiers arrive and scatter the Viking looters. The Viking camp is surrounded and Charles placed his troops at the base of Montmartre. The Vikings didn’t flee as expected and Charles began to have second thoughts about engaging them in battle. He opts for negotiations. Siegfried vows to torch the city if they are not paid. In early November, Charles agrees to pay tribute of seven hundred pounds of silver in the month of March in return for their lifting the siege and going to Burgundy where the emperor was dealing with a revolt. The Vikings pillage and loot Burgundy all winter. The Norse remaining in Paris pulled their boats on land around the city traveling further up the Seine and Yvonne rivers, attacking Melun and other areas, devastating the countryside. These Vikings and Siegfried and his men return to their former camp in Paris and receive their silver tribute from Charles in March. Siegfried soon leaves for Friesland where he died in battle but the others continue to loot the countryside of Francia. The reputation of Charles the Fat is seriously undermined by his dealing with the Vikings. He dies in January of 888, signaling the end of the Carolingian Empire. Others are elected king of East Francia and West Francia. Odo is the new Western king. Paris, which was a minor city under the Carolingians was now established as a city of major importance in the center of West Francia. The most significant consequence of the siege was the end of the Carolingian dynasty of kings and the beginning of a new dynasty, the Capetians, relatives of Count Odo. The people of the region ceased to be called Franks and become known as the French. 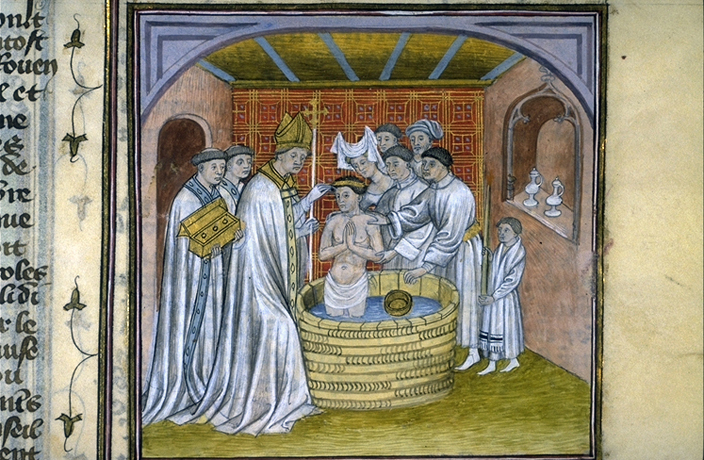 Depiction of the baptism of Rollo, from a fourteenth-century French manuscript, Toulouse Library. The Norse were to some extent successful after sacking some of Paris but the siege took its toll on their numbers. Viking raids in western France became less frequent after this. However, Rollo later made his name and fortune with an expedition to besiege Chartres in 911. Holding the city was King Charles the Simple and a band of aristocrats. Charles gained the upper hand and Rollo realized he could gain nothing by continuing the fight. Charles agreed that Rollo could be a valuable ally in fighting further Viking incursions and began negotiations. The result was the Treaty of Saint-Clair-sur-Epte which granted Rollo lands in what is now Normandy. In return Rollo agreed to safeguard King Charles from Viking attack and to be baptized as a Christian. Rollo is the ancestor of William of Normandy, otherwise known as the Conqueror. 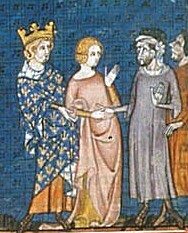 According to tradition, Rollo also agreed to marry Charles the Simple’s daughter Gisela of France. Rollo was betrothed to her after his conversion to Christianity and acquisition of Normandy. The legend maintains that Rollo was cruel and merciless in his treatment of her. Her father sent two knights to support her in Normandy but Rollo had the two men captured and beheaded in the Place du Vieux Marché in Rouen in front of a crowd. The marriage and indeed, even the existence of the Princess Gisela are not confirmed in any written historical record. If she did exist, she may have been the illegitimate daughter of King Charles.